Summary: A heartfelt fiction debut that will appeal to fans of Emily Giffin’s Southern charm and Jennifer Weiner’s compelling, emotionally resonant novels about the frustrations of blood ties, Cancel the Wedding follows one woman’s journey to discover the secrets of her mother’s hidden past—and confront her own uncertain future. 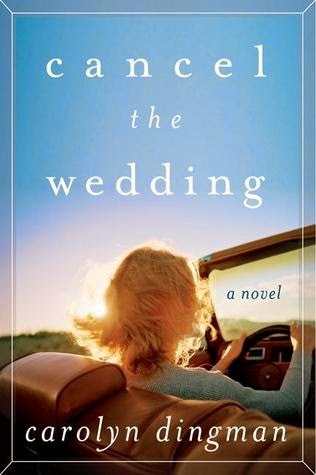 Review: Cancel the Wedding by Carolyn Dingman is the debut novel from the author. Cancel the Wedding follows who Olivia has it all, or at least she seems as though she has it all to everyone else. She has a career, a family, and is engaged to be married to the handsome Leo. It seems like she is finally coming to grips with the loss of her mother from cancer a year earlier but there is just one thing left to do. Liv's mother, Jane had one last request: for her ashes to be scattered in her old hometown. A hometown that she never spoke about with Liv of her older sister, Georgia. This leaves Liv wondering and searching for answers. Olivia decides to travel to her mother's hometown ahead of time just to get everything arranged. Her fourteen year old niece, Logan decides to ride shotgun and they have a bit of a summer road trip together. This book was such a breath of fresh air for me and had me totally invested in the characters. There are basically two stories being told-- the story of Jane and discovering her past that she left behind years before and discovering what exactly has tied her to her hometown. And then there's Olivia's story in the present day where you can clearly see the struggles that she is facing. Does she stay with Leo just because it is "comfortable", does she keep her job just because that is what she is expected to do? Their lives and struggles definitely seem to intersect at a few different points. I really don't want to give anything away about the plot, or about the life that Janie left behind because that is what I enjoyed the most. Delving into her fast and finding out - what was her life like there? What would she have kept from her daughters who were seemingly her entire world? I adored many of the secondary characters that are introduced throughout the story- Logan, Graham, Elliott and even many of the townies were just so well developed. There were a lot of characters who had shorter cameos in the book, but I found myself thinking one thing- they were all so charming and I wanted to visit there. I wanted to spend my summer with Olivia, Logan and the others looking in to her mother's past because there was such a story to tell. And there was so much that Olivia would learn from her mother, Janie that could lend to her life. I absolutely adored this book, the story, the setting- everything. I look forward to reading more emotional, touching reads from Dingman in the future and if you like women's lit, stories about discovering what makes you happy and family secrets coming to surface I say pick it up today!